Revelation pt. 8 – Hail Of An Talent. “And the seventh angel poured out his vial into the air; and there came a great voice out of the temple of heaven, from the throne, saying, It is done. And there were voices, and thunders, and lightnings; and there was a great earthquake, such as was not since men were upon the earth, so mighty an earthquake, and so great. And the great city was divided into three parts, and the cities of the nations fell: and great Babylon came in remembrance before God, to give unto her the cup of the wine of the fierceness of his wrath. And every island fled away, and the mountains were not found. And there fell upon men a great hail out of heaven, every stone about the weight of a talent: and men blasphemed God because of the plague of the hail; for the plague thereof was exceeding great.” (Rev. 16:17-21). Under God’s wrath in the seventh bowl of Revelation. 16, which continues to unfold the events of the year 70, we are witnessed an even more dramatic evidence of the first century fulfillment. There are two characteristics that appear here. One is that the city is divided into three and the other one is the big hail that fell from the sky. The city is divided into three parts. Many people interpret this that the town (Jerusalem) is physically divided into three by an earthquake mentioned in Revelation. 16:17-21, we see that this has not happened. They believe then that this will happen in the future, but again, I refer to that previous post that Revelation is about the first-century events, specific to the events of the years 64-70 AD. “And now there were three treacherous factions in the city, the one parted from the other. Eleazar and his party, that kept the sacred first-fruits, came against John in their cups. Those that were with John plundered the populace, and went out with zeal against Simon. This Simon had his supply of provisions from the city, in opposition to the seditious.” (War. 5:1:4). “When therefore Titus had marched over that desert which lies between Egypt and Syria, in the manner forementioned, he came to Cesarea, having resolved to set his forces in order at that place, before he began the war. Nay, indeed, while he was assisting his father at Alexandria, in settling that government which had been newly conferred upon them by God, it so happened that the sedition at Jerusalem was revived, and parted into three factions, and that one faction fought against the other; which partition in such evil cases may be said to be a good thing, and the effect of Divine justice.” (War. 5:1:1). “Now as to the attack the zealots made upon the people, and which I esteem the beginning of the city’s destruction, it hath been already explained after an accurate manner; as also whence it arose, and to how great a mischief it was increased. But for the present sedition, one should not mistake if he called it a sedition begotten by another sedition, and to be like a wild beast grown mad, which, for want of food from abroad, fell now upon eating its own flesh.” (War. 5:1:1). As Josephus said, “which I esteem the beginning of the city’s destruction”, John also prophesy, “And the great city was divided into three parts, and the cities of the nations fell” It was thus the political disagreements and divisions into parties which divided the city into three parts. Stone used in Roman catapult. This is found at Massada, Israel. It have been many theories about what these shotguns are too. One of them is the bombs with poisonous gases such people “burn” alive. With today’s technology and knowledge could make it possible, but again, we are talking about the year 70 AD. “The engines, that all the legions had ready prepared for them, were admirably contrived; but still more extraordinary ones belonged to the tenth legion: those that threw darts and those that threw stones were more forcible and larger than the rest, by which they not only repelled the excursions of the Jews, but drove those away that were upon the walls also. Now the stones that were cast were of the weight of a talent*, and were carried two furlongs and further. The blow they gave was no way to be sustained, not only by those that stood first in the way, but by those that were beyond them for a great space. As for the Jews, they at first watched the coming of the stone, for it was of a white color, and could therefore not only be perceived by the great noise it made, but could be seen also before it came by its brightness; accordingly the watchmen that sat upon the towers gave them notice when the engine was let go, and the stone came from it, and cried out aloud, in their own country language, THE STONE COMETH so those that were in its way stood off, and threw themselves down upon the ground; by which means, and by their thus guarding themselves, the stone fell down and did them no harm. But the Romans contrived how to prevent that by blacking the stone, who then could aim at them with success, when the stone was not discerned beforehand, as it had been till then; and so they destroyed many of them at one blow.” (War. 5:6:3), (* My emphasis.). Just imagine and try put yourselves into their place. For at that time, it had to be a surprising sight to see these stones of 34.2 kg (one talent) flying over the big wall of Jerusalem and do the vast damage that they did. This experience set the perfect reality of John’s view of these enormous hailstone. Jerusalem was now stoned in accordance with the law for an unfaithful woman, for Jerusalem had become a harlot (Revelation 3 – The Harlot). “And another angel came out of the temple which is in heaven, he also having a sharp sickle. And another angel came out from the altar, which had power over fire; and cried with a loud cry to him that had the sharp sickle, saying, Thrust in thy sharp sickle, and gather the clusters of the vine of the earth; for her grapes are fully ripe. And the angel thrust in his sickle into the earth, and gathered the vine of the earth, and cast it into the great winepress of the wrath of God. And the winepress was trodden without the city, and blood came out of the winepress, even unto the horse bridles, by the space of a thousand and six hundred furlongs.” (Rev. 14:17-20). John following up the Old Testament pattern her and gives us a picture of the wine. 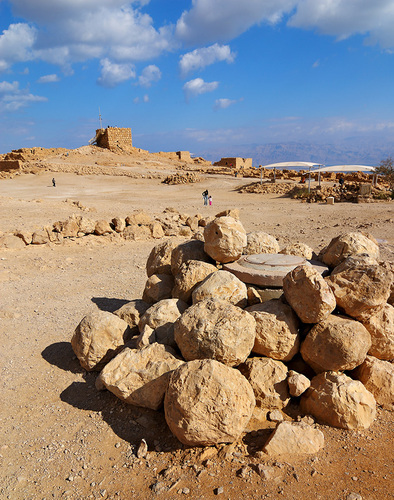 As known to many, Israel symbolizes as wine of God, which we find in Sal. 80:8, Isa. 5:1-7, Jer. 2:21; 12:10, Ezek. 17:2, 6; 19:1, 10, and Mat. 21:33-40. But do we believe that the blood actually flowed beyond 322 km (Greek: 1600 stages), and so deep as to bridle of the horses? Israels land under Roman Empire. From Leontes River to Wadi el Arish in Egypt. “… because not only the whole country through which they fled was filled with slaughter, (War. 4:7:6). “…and Jordan could not be passed over, by reason of the dead bodies that were in it, but because the lake Asphaltiris was also full of dead bodies, that were carried down into it by the river.” (War. 4:7:6). “insomuch that the sea was bloody a long way, and the maritime parts were full of dead bodies;”” (War. 3:9:3). 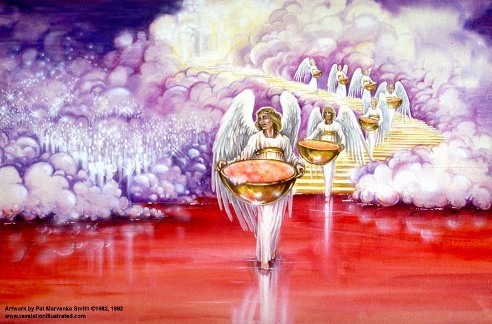 one might then see the lake all bloody, and full of dead bodies, for not one of them escaped” (War 3:10:9). “And now the outer temple was all of it overflowed with blood; and that day, as it came on, they saw eight thousand five hundred dead bodies there.” (War. 4:5:1). “the blood of all sorts of dead carcasses stood in lakes in the holy courts… ” (War. 5:1:3). “the whole city run down with blood, to such a degree indeed that the fire of many of the houses was quenched with these men’s blood.” (War. 6:8:5). That the sea became blood, we also see examples of in Rev. 8:8 and 16:3. The Lamb, the slaughtered lamb pours out his wrath (Rev. 6:16-17) of those who crucified Him (Rev. 1:7). Although Revelation can not interpret literal, it portrays the historical events in the Jewish war in 70 AD, which we have considered. We have been through some incredible events that correspond between John and Josephus … and there are many more I could bring in, but it will take too much space.